We purchased these for our son and daughter-in-law for Christmas 2016. We went over to spend some time with them this weekend. Out of conversation my daughter-in-law said you know the dishes we got them for Christmas she loves them. Haven’t had a broken, cracked or chipped piece. She wanted the information on where I got them and the series style etc. She wanted to see if there were any other pieces that go with her set. I would recommend these. Harmonize your next dinner perfectly with this sophisticated dinnerware. This elegant stoneware service for four includes four cozy 12-ounce mugs, which are ideal for serving your after-dinner coffee. Just got a few hours ago and can’t wait to serve dinner tonight. The taupe is even more attractive than imagined. Fits in so well with everything in the cooking and dining area. The quality of the stoneware is unbeatable. 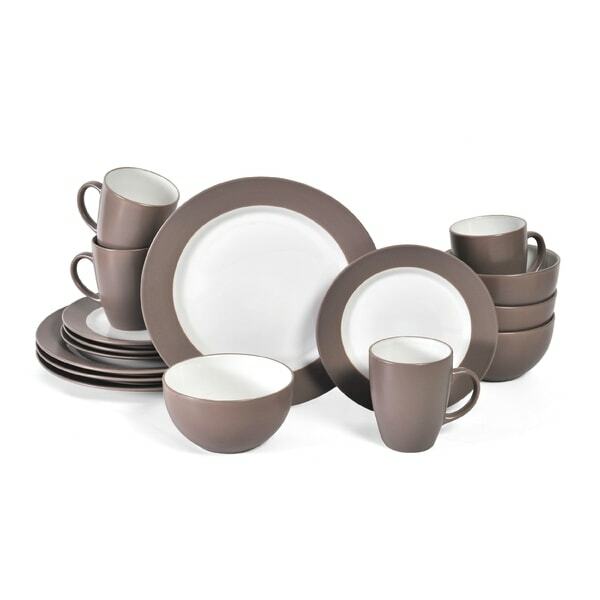 This dinnerware set is of great quality and looks very modern. it matches my kitchen decor nicely as well. 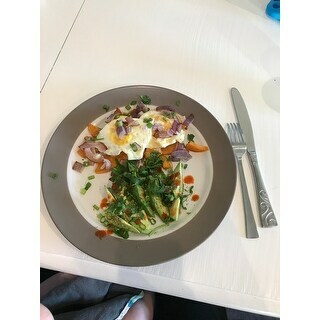 I love that it has a bit of color without taking away from the meal on the plate. Picture and product are the same. Nice quality for stonewear. They are great. I ordered another set. Wish mugs were a little larger. Plates, bowls are perfect. I really like my set. I bought this set before i moved into my next apartment. I picked this color because it pretty much goes with anything and i was right. The quality of dish set is amazing. I ordered this set for my daughter for Christmas. I was nervous about ordering glassware online and wouldn't you know it, one mug was broken when it arrived. I assumed I would have to send the entire set back but Overstock was able to locate and ship just a replacement mug. They handled the whole thing professionally and promptly. The replacement even arrived in time for Christmas! I will use Overstock again. Simplistic elegance. Works for everyday dining or place a silver charger under the dinnerplate for formal or special Occassions. A truly versatile setting which is also practical _ microwavable. Purchased these for my daughter and her roommate who just moved in for college, they are so cute and they seem to love them. Washed easily and also can be place in the dishwasher. Great starter set and would work great for family as well if you purchased more than one set. I really like this set of dishes. The neutral color made it easy to coordinate with the colors of the holiday. Just be careful with the bowls and the mugs as they can easily slide out of your hands when wet. This was a gift for my daughter who was very pleased with the quality and the muted colors. I love these dishes. Very durable. Gorgeous dishes. The most perfect shade of taupe, you could put them with any color and they would look great. Styling tip: they’re exceptionally beautiful against silver and champagne. The dishes look nice and wash well in the dishwasher. I bought 4 sets and a couple had chips. When I called, they sent new dishes right away!! I got these for a gift and she loves it. Matches beautifully with everything I have in my kitchen. Amazing quality and so beautiful! "Is this more grey? Or more brown? I can't tell from the picture."